Feel that crisp October chill in the air? That chill ushers in my favourite of the festive occasions: you guessed it, Halloween. If the spooky spirit of the season inspires you to celebrate all things horrific — or, like me, you celebrate such things on a regular basis — then below are some suggestions for Halloween-themed film viewing. I’ve grouped my suggestions into two distinct categories, and these I will separate across two blog posts. This first post offers up a small group of films I’ve labeled Ghoulish Delights. These are mainly campy, horror-comedy films best suited for Halloween party gatherings. Oh sure, there’s buckets of blood and disturbing scenes, but they’re all served-up with a big, mischievous wink. A follow-up post will address the second group, Pushing Boundaries, that will focus on horror films with considerable bite. These are films that either challenge or re-imagine standard narratives within the genre, or films that simply push the boundaries of taste and acceptability in contemporary horror. 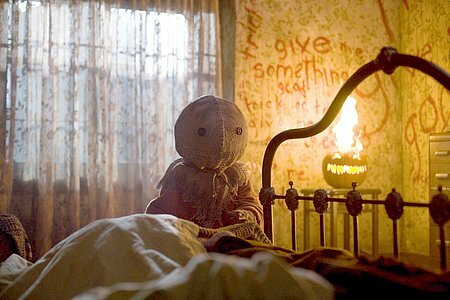 Michael Dougherty's sack cloth-headed horror mascot Sam (after 'Samhain', of course) from his little-known horror anthology "Trick r Treat" (2007). Despite only a handful of public screenings, the film has been reviewed extensively by online journalists and bloggers, especially in the genre/horror communities, and reviews are nearly unanimously positive. Dread Central gave it 5 out of 5 stars and stated “Trick ‘r Treat ranks alongside John Carpenter’s Halloween as traditional October viewing and I can’t imagine a single horror fan that won’t fall head over heels in love with it.” The film earned 10 out of 10 from Ryan Rotten of ShockTilYouDrop.com. It also earned an 8 out of 10 from Bloody Disgusting, who later ranked the film ninth in their list of the ‘Top 20 Horror Films of the Decade’, with the article saying, “[It’s] so good that its lack of a theatrical release borders on the criminal.” IGN attended a screening of the film and concluded, “This well-crafted Halloween horror tribute is a scary blast.”, rating it 8 out of 10 overall. Based on 17 reviews collected by Rotten Tomatoes, the film has an overall “Fresh” approval rating from critics of 85%, with an average score of 7.7/10; the site’s critical consensus states “An deftly crafted tribute to Halloween legends, Trick ‘r’ Treat hits all the genre marks with gusto and old fashioned suspense.” — from Wikipedia. Dougherty’s Trick ‘r Treat possesses the same irreverent black humour of horror-anthology franchises such as Creepshow and Tales From The Crypt, which gives the film a quality of both nostalgia and homage. Five interwoven tales of the macabre introduce us to the creepy Principal (played to the hilt by the gloriously creepy Dylan Baker), a self-conscious 22-year-old virgin portrayed by a pre-True Blood Anna Paquin, and a school bus packed with the vengeful ghosts of children in Halloween costumes. The one common element throughout all five stories is the presence of Sam, the mysterious and silent trick-or-treater who seems to embody the very spirit of Halloween. 2. I do love me some Bruce Campbell. This veteran actor of the B-horror genre — best known as Ash from Sam Raimi’s Evil Dead films — was perfectly cast as an old Elvis Presley in Don Coscarelli’s Bubba Ho-tep (2002). When a re-animated ancient Egyptian mummy suddenly appears in the nursing home in which Elvis lives, drastic action must be taken to destroy the creature and free the consumed souls of the nursing home’s elderly occupants. Serious fun. He's back from the grave and ready to party in "Return of the Living Dead" (1985). 3. Have you ever wondered where that whole “zombies eating human brains” thing comes from? Nope, not from George A. Romero. 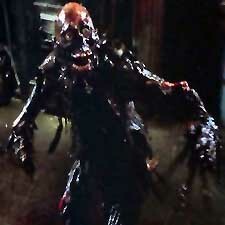 The brain-eating zombie originated entirely from Dan O’Bannon’s Return of the Living Dead (1985). * In the words of one of the film’s reanimated dead, zombies seek out and devour human brains because “…it hurts to be dead…I can feel myself rotting” and “brains kill the pain”, however temporarily. So, there you have it. O’Bannon’s Return of the Living Dead is both a playful satire of, and a respectful homage to, earlier zombie films like those of Romero. Cheesy ’80s vintage camp in all the right places, this film boasts reasonably convincing zombies and the ‘scream queen’ actress Linnea Quigley, who spends almost her entire screen time completely naked save for a pair of blue stockings. Must’ve been a cold shoot for Ms. Quigley. 4. Edgar Wright’s Shaun of the Dead (2004) is another — much, much better — satire/homage to the zombie horror genre. It’s such an exemplary horror-comedy that it’s pretty much a given, and I need not discuss it further here. 5. I mentioned Sam Raimi’s Drag Me To Hell (2009) in last year’s Halloween list, but the strength of this film cannot be overstated. A hilarious horror-comedy with some legitimate scares thrown in — an extraordinarily difficult balance to achieve and quite the accomplishment for Raimi, who adeptly showed us that he still knows how to do it. *There was a single, zombie-eating-brains scene in Lucio Fulci’s City of the Living Dead (1980) but, to the best of my knowledge, this is the first film that truly places brain on the menu for the undead. ← Lady Lazarus’s 2011 Halloween Party Movie Night: Scary Films for Kids.